Ahead of this weekend’s trip to Ashton Gate, episode three of Great British Bake Off provides me with a prescient and convenient maxim: you can’t make a good loaf without good ingredients and experience. On-the-field assets are the key ingredients in any footballing success. Last season the Bristol City manager, Lee Johnson, spent in excess of £10million in the transfer window including a club record signing of number nine, Famara Diédhiou. This campaign, Jack Hunt, Mo Eisa and Marley Watkins have all moved to Ashton gate for upwards of a £1million apiece. A £20million net-spend over three transfer windows demonstrates the backing Johnson has enjoyed, but it has followed that such outlays afford success. Last year, the Robins failed to finish ahead of the Blades whose 18-goal top scorer, Leon Clarke, cost a fraction of the £5.3million of his opposite number. Money goes a long way in football, but only so far. That’s something that Chris Wilder ‘gets’. When the Blades enjoyed a 3-2 victory over Bristol on the final day of last season, the away end was sobered by Chris Wilder’s public remonstrations to United’s co-owners. He did not demand game-changing investment but the stability required to manage a Championship football team. “Direction and clarity,” was the ask. 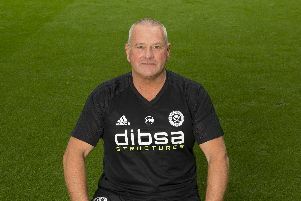 The response, not a long-term solution, was sufficient to keep Wilder at Bramall Lane. Boy, am I glad. Under his guidance, United will finish above Bristol City this season…I don’t believe in luck, I haven’t jinxed us. It’s Wilder’s task to prove this hypothesis, and he’ll need to if the Blades’ play-off ambitions are to come close to fruition. You need only contrast his 53 per cent win ratio as manager of United to Johnson’s 39 per cent as Bristol boss to see that the logic behind the assumption is as rational as it is, I assure you, heartfelt. The stats are compelling, but it’s experience that will prove the key ingredient in Wilder’s recipe for success. Wilder knows how to get the best out his players in times of adversity: from beers on the bus when United slumped to the bottom of League One, to promotion with Northampton after perilous financial problems – he’s turned clubs around. Arguably, the Blades’ fortunes have been turned around already this season by his quick adaptation to circumstances on and off the pitch this season. It is not a criticism of Johnson to brand his experience inferior, nor is it arrogance to stand on the soapbox and proclaim my confidence in Wilder. It is, in large part, a simple observation based on evidence: Johnson has never won promotion as a manager, Wilder, on the other hand, has four promotions to his name and in his first season in the Championship finished higher than Bristol City. Johnson is a manager I like. He might be softly spoken and well known for his methods of iPads and touch-tellies to get his point across to players, but his new age demeanour belies a ruthless will to win; let’s not forget Bristol had a ‘good go’ at Manchester City in last year’s League Cup semi-final. His Bristol side has made a strong start to the season, beating the likes of Swansea, who subjected the Blades to defeat on the opening day. They are a good side, no doubt about it. However, United’s start has been stronger, the performances stronger too and crucially, those performances have all resulted in all three points. Experiencing winning – winning promotion, winning games, winning titles, winning the support of fans and the buy-in of players – is an intangible quality, rendering the chit-chat of football fans inarticulate in light of honest, gut-instinct. I cannot explain with expert precision why Wilder’s experience will mean we finish above Bristol, I can just feel it.